← I'm A Contender ! When I was a little girl we would sometimes, as a special treat, be served one of our favorite entrees. My mom had several ways to serve this yummy treat. Sometimes she would chop it up and serve chunks of it in beans. Other times she would combine it with pineapple chunks and homemade sweet and sour sauce and serve it over rice. My favorite way to eat this delicacy was to simply fry it up in a pan. This delectable delight was called Spam. As kids, our taste buds still weren’t sophisticated enough to know that Spam was really kinda icky. (Hey, we were also big fans of Cheez-Wiz and Vienna Sausage!) I know why we liked it, I’m just not sure why my mom bought it. Although I suspect it may have had something to do with stretching out that military paycheck. A few years later, the Internet was invented. It was a wonderful tool used primarily the government and for educational purposes. In fact, it was so wonderful that the masses felt left out. They demanded access and to be given a voice in this brave new world. (And that’s where bloggers came from). And where the masses are…the vultures come. Everyday I get my daily serving of unwanted Spam. It ranges from stock tips and cheap pharmaceuticals to learning to please my woman. (Oh yeah, they even tell me where I can get myself a woman if I was so inclined). Today…my blog received it’s 6000th piece of Spam. I wonder how that would taste if I fried it up? Of COURSE the geek that I married just happens to have an empty Spam can in the computer room! This entry was posted in It's all about me!, Random stuff, Technology, That Man O' Mine. Bookmark the permalink. he he I am very tired of deleting spam, Susan =). Belive me i am not spaminy your blog. Are you thinking i am spamming? If yes, you can also do the same on my blog. Saturday Night Special on a Thursday Night oh can life get much better? Well, I’ve always wondered what SPAM actually looked like because I receive so much of it in my e-mail messages. I just didn’t know it came in a can. Now I know. But for real, theHansMan’s favorite meal when we married was cream corn and Spam…I almost gagged when I finally got it out of the can. It made this kind of sucking noise and then plopped out onto the skillet. How was I supposed to know to slice it and fry it? The madness continues at my place. The polls are open. You know Spam is HUGE in Hawaii. They have an annual Spam Festival and the Burger King there even serves Spamburgers. We’re going there next summer and you can bet I’m getting a Spamburger because that’s the kind of food I think of when I think of Paradise. Not really. I lived in Austin, MN, where they make the SPAM, for five years. It’s not something a person gets over, that smell. Ahh…Spam. The funny name says it all. Perhaps you could make a tasty Spamburger with that 6,000th peice…cover it in Cheezwhiz and it’ll be tasty! rofl!!! Thanks for the info. I love the Monty Python skit. Believe it or not, I have never eaten spam… Not because I didn’t want it or anything, it just wasn’t introduced in my house as a child and now I know what it is and I haven’t mustered the courage to try it. Spam, spam, spam, spam, wonderful spam . . . I know we had Spam, cut I don’t remember it too well. I do remember the Vienna Sausages, though. Ew. On my way over to Swampy! Pretty~They are a pain aren’t they? Swampy~With creamed corn? Ewww that’s the 2nd worse food group! Jenster~I had forgotten that. I remember seeing the Spamburgers at a fast food drive though. Jocelyn~You poor, poor thing. It never occurred to me that someone made it on purpose…I thought it just arrived from space or something like that. Pavel~What kind of horrible place did you grow up in?!!! Your mom *seemed* so nice…. Oh, I forgot to say THANKS to everyone that keeps voting for me! I’ll remember you ALL when I am a famous Special Award Winner!!!! Hmm … my blog gets almost no spam at all. And I don’t even have the word verification turned on. I may get spam mail because of my blog, but gmail does a good job of filtering it out. I don’t get much Spam at all…..maybe I should be spam-jealous. We never ate Spam. My mom said it was because my dad had to eat so much of it while he was in the army, he couldn’t stand the sight of it. I thought I was missing out on something because my friends got to have it. How funny. I think I just broke 300 Spams since I have moved to WordPress – before that I never saw them. Happy Spam Day, Susan! Jay~Wordpress has a feature that uses Akismet. It’s a program that blocks all the Spam and counts it for you. I usually go through because it sometimes catches certain phrases like “new trick” that are actually OK.
Tommiea~Would you like me to forward some to you? gawilli~That is really funny! The things we are jealous of. My best friends mom was always making homemade tortillas that I would gobble down. Hmmm…I would still love to have those. When growing up, on our family camping trips we always brought spam along. I don’t remember eating it any other time though. Same for Vienna sausages. I admit I still like both……and Cheez Whiz too. Spam stands to prove how much gunk we hv in this world. LOL! Spam? You actually ate that stuff? I thought you were supposed to buy Spam and then keep it in your cupboard forever in case the power went out. We ate Spam, too! I remember Spam and scrambled eggs for supper. I tagged you for a meme that I think you will enjoy doing so go check it out! In Ausyin Texas they used to have a Spamarama celebration every year. I remember eating some really vile spam dishes there! Sorry you lost the Swampwitch contest – I did SO like your prose! I loved Spam growing up. Sometimes I think of buying a can for old times sakes. Spam on your blog? And so much? That stinks! Heh heh heh! Spam…that is something that is always around in our family. My Dad is a HUGE fan of Spam. He’ll eat it anyway you slice it. I, on the other hand pretty much only eat it when it is cubed up in tiny cubes and fried up in scrambled eggs with LOTS of cheese. I’ll have to get a picture of the top shelf of our food cabinet…you can’t imagine the number of spam cans and vienna sausages that are there…scary, really! LOL! I did vote for you every day, btw…I don’t know the results yet, but I know you deserve the win!!!! OOOOh. Spam, Vienna Sausage, Potted Meat. I couldn’t believe the stuff my (future) husband ate the first time I saw the contents of his kitchen cabinets. He will still buy potted meat, spread it on two slices of white bread, and eat it for lunch. But he eats green vegetables now, too. Go me! Funny, and a trip down memory lane. When we had vacation in Hawaii a few years ago it was during the Spam Festival. They did everything imaginable with that stuff. Actually at a franchise called L&L restaurant (A Hawaiian restaurant)on the Mainland, its very prominant on the menu. We use to get spam free from the government surplus. I loved it then but hate it now! 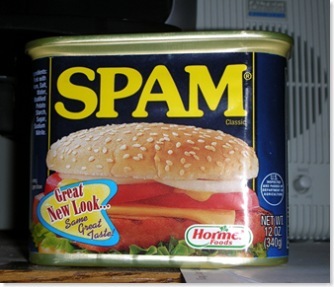 SPAM (or Specially Processed American Meat) was created to help lessen the food shortages in Britain in the aftermath of WWII, and is now one of the staples of Hawaiian cuisine. I’m not kidding! There are actually restaurants that only serve SPAM! Useless info I know, but hey that’s what I’m all about. Plus I’ve actually worked on the manufacture of the stuff. Here is a great Spam recipe. It’s called Spam Polinesian and it does cut that bad after taste. Try it you’ll like it.. 1 can spam diced, 1 can pinapple chunks/tidbits, 1 pack wild rice /brown rice. Fry your spam cook the rice. Add pinapple and cooked rice to the spam. Drizzle a bit of Soy sause and enjoy! Makes about three large portions and 5 regular. Funny but that nut Andrew Zimmern will eat anything from rotted meat and raw eggs in some rathole in Arabia to eating the eyes of a freshly caught fish in Vietnam, but the thought of eating Spam turns his stomach. Love dem chunks of Spam in red beans and rice here in New Orleans.